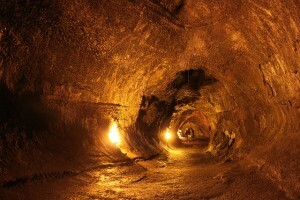 In a strange incident, a teenager fell into a lava tube on Wednesday evening in Hawaii Volcanoes National Park. The 15-year-old boy survived the 6 meter (20 foot) fall into the lava tube located near the visitors center. Reported to authorities at 6:44pm, fire department rescue crews soon attended the scene and lifted the boy out using lifelines. Examined by medics after being rescued, he was found to be uninjured. The cause for his fall remains unknown.